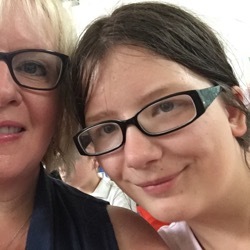 Our D. You could describe her as many things – stubborn, anxious, cuddly, loving, enthusiastic, excitable and yes, autistic – but being “mean” isn’t one of them. But that’s what she was referred to as today. By two pupils who think it’s funny to tell people they’re “ugly” or “mean”, yes this does happen amongst SN pupils, unfortunately. D has a tendency to store up any negativity from the day and, as this incident happened at lunchtime, poor D kept it all hidden until she started coming down the stairs at the end of the school day and then started crying. Her TAs had no idea what had caused the tears and they had known nothing about what had happened, because D hadn’t said anything. She doesn’t like to speak up, because she worries that she’ll “get told off” that she’d be “telling tales”, but as she’s been told so many times before, she has to tell an adult when something does happen so that it can be dealt with quickly. D was sobbing into my shoulder as both the TA and I reassured her that she wasn’t “mean”, that sometimes other people say things that will hurt other people because they enjoy seeing them upset or maybe (unlikely in this case, as the two concerned have “form”) that they don’t have the understanding of what they are saying. It’s difficult, I can’t wrap D up in bubble wrap, she will face nastiness and hostility as she gets older but the issue is (and will continue to be) that she lacks the confidence to either retort or just tell them to “stop it”. In the meantime, she knows she is extremely loved, thought a lot of by her friends and staff at school and she gives the best rib-squishing cuddles, ever!